I was in the mood for a delicious, fresh smoothie the other day and this one really hit the spot! I love smoothies that are thick enough to need a spoon and this one was awesome! Our blender isn’t working so we used a food processor and the results were great! 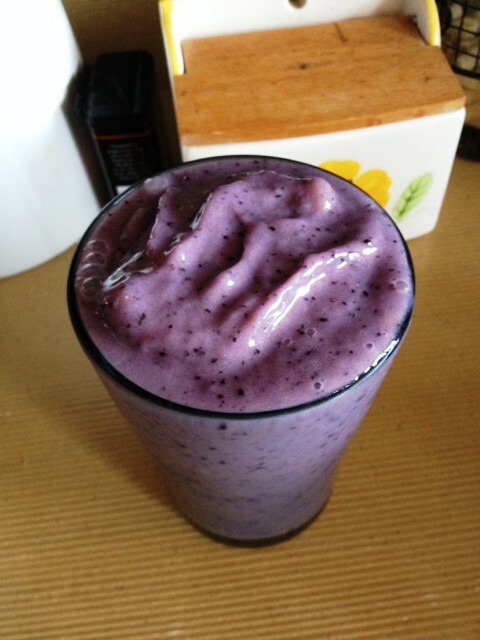 Feel free to replace the blueberries with any other frozen berry…it should work out the same. Put frozen fruit into blender/food processor and add the yogurt. Add a splash of milk and start blending. Add more milk until smoothie becomes desired thickness. *You may have to stop blending and use a spatula to clean the sides of the blender/food processor. *Milk substitute such as vanilla almond milk works great in this recipe! *Small frozen banana chunks left in the smoothie are fine and actually taste delicious.